Trainer Henry de Bromhead celebrated his second victory in three years in the race after 9/2 shot Sizing Granite ground out a length win over God's Own to follow the example of his stable-mate Special Tiara, who won the 2013 running. 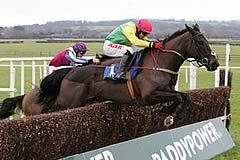 De Bromhead said: "He jumped brilliantly. He's always been a gorgeous horse. Alan and Ann [Potts, owners] have been really patient with him and given him time but he's getting better and better. "He's massive and was very immature and I hope he's going to keep improving. It's very unlikely that he'll go to Punchestown but is very exciting for next year." Commenting on winning jockey, J J Burke, the trainer added: "He's a very accomplished rider for one of his age. He gets better all the time and he's a great man to have on your team. "I'd go as far as saying I put Aintree ahead of Cheltenham. It's such a welcoming meeting and the atmosphere is great." Jockey Johnny Burke seems to have narrowly missed out on a Crabbie's Grand National ride, but he gained a Grade One win in the Doom Bar Maghull Novices' Chase. Riding the Henry De Bromhead-trained Sizing Granite for owners Ann and Alan Potts, Burke took up the running before the second-last and held the sustained challenge of runner-up God's Own. The jockey had hoped to ride Raz De Maree for trainer Sandra Hughes in today's big race, but the horse's handicap mark proved just outside the 40 who made the cut. Reflecting on today's win the jockey said: "He was a pleasure to ride and a great jumper, as he showed. I put his jumping to good use and got them all on the stretch. He was idling a bit at the last ditch, but overall his jumping was great. "He has great size and he uses that. I thought the flat track here would suit him and while the race cut up a bit the second is a very good horse. The big key [to Sizing Granite] is to keep him fresh and Henry had him spot on today. "I've been riding for three years this weekend and have been professional for just seven months and I feel so lucky, but it's all down to Ann and Alan Potts for giving me a chance. It's sweet. When I was growing up I wanted to be a jockey and I'm very lucky to be in the position I'm in. "I wanted to be here on [Crabbie's] Grand National day, and while it was disappointing to miss out on a ride in the big race I'm glad to be riding winners."